The release date for Raekwon’s Shaolin vs. Wu-Tang is almost upon us (Click here to read my review of the album). The title song has been circulating for some time now. In the Wu’s heyday, one might have expected a somewhat polished video for it to be put into heavy rotation on Rap City. In today’s world of viral marketing, smaller scale productions premiere on the web instead of on television. It is through these means that the video for “Shaolin vs. Wu-Tang” makes its debut. This unceremonious unveiling is actually very much in keeping with the video itself. During an animated introduction, the Wu-Tang master beds a young woman in his private domicile. He is alerted to the presence of an armed intruder who lurks in the shadows. A mortally wounded pupil cries out “Master!” while clutching his bloodied chest. The Wu-Tang master then engages the intruder in hand to hand combat. Light from a window reveals that the attacker is wearing the scorpion mask from The Five Venoms. The two then begin to argue in badly dubbed English voices. The Scorpion then removes his mask to reveal his true visage. As the desperately dramatic violins of the song kick in, the animated segment morphs into an opening credits montage fashioned in the style of an ancient Chinese scroll painting. Things transition over to live action footage. 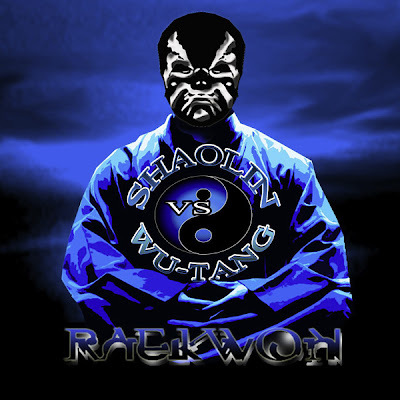 Raekwon is in the midst of recording when his studio session is interrupted by a battle between cartoon ninjas. Studio equipment is assailed by throwing knives and Shuriken. The studio crumbles as the battle rages. Undeterred, Raekwon continues laying down his vocals atop pulsating drums. The cartoon portions of "Shaolin vs. Wu-Tang" are crudely drawn and animated. This is reminiscent of old cartoons with limited frame rates. The dialogue is obviously sampled from a classic Kung-Fu film. English and what I assume to be mandarin or Cantonese subtitles appear at the bottom of the screen. The subtitles are of the same variety as those found on many of the old VHS bootlegs of martial arts movies. They are barely visible when the background is brightly lit and/or contains bright colors. These touches might seem to be nothing more than poor production at first glance. In actuality, they pay homage to the sort of B-level entertainment that has always fascinated the Wu. There is a bit of dialogue at the one minute and 32 second mark that seems to address the formless nature of hip-hop itself. More specifically, it seems to refute the sense of ownership that older fans feel toward the music. It could also be a statement about the Wu-Tangs very legacy, which must evolve to stay relevant. For martial arts and animation aficionados like me, the video for Shaolin vs. Wu-Tang is a nostalgic delight. It’s intimately small-scale and made specifically for those who are on the Wu’s wavelength. It’s an amusing piece of marketing that will likely get many replays. Director Konee Rock has crafted a low budget delight that will leave newcomers baffled and long time fans with Cheshire cat grin. CLICK HERE FOR THE ALBUM REVIEW!